It's time again for a Cupcake Inspirations challenge. This week we got to use images from Sassy Cheryl. Isn't this little girl adorable?? Be sure to check out all her images. I know you will find one (or twenty) that you can't live without. I used the PaperTrey Ink Tag Sale #3 die to cut my little white tag. What I love about this die is that it cuts out that cute little border with one pass. Love it! Here is this week's challenge photo. Be sure to check out the challenge sight and submit your own great project. Then I will see you again for a fun birthday card. 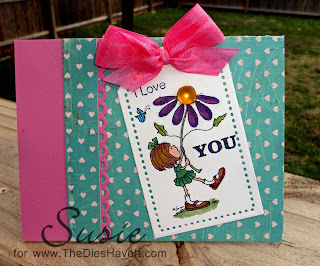 Love the tag with the border - super cute! So cute! Love the heart paper! Cute card! I have several of sassy cheryl's digi's and love them! I'm also on the paper craft planet group of sassy cheryl's. It' a group of ladies that love her images and cheryl herself is on it. We usually pop in and chat everyday. You should check it out and join us!